Learning more about the ability and flexibility of WordPress can really help to improve the functionality of your WordPress site. The Links and Link Categories panels or sub menus can be used beyond the intended purpose of just adding links to the sidebar. 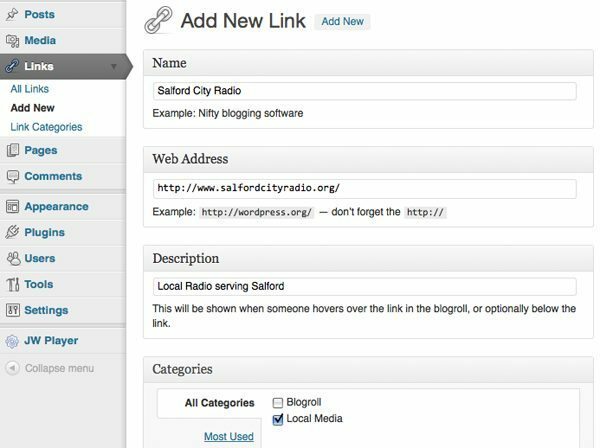 In fact with the addition of a simple WordPress plugin the WordPress links sidebar widget can not only be split into separate categories but each link category can be placed anywhere in any sidebar. The first step is to get a handy little WordPress plugin called Single Bookmark Category List. The one file plugin installs like any other, just upload the file to your wp-admin/plugins folder and activate it. Now here is where you see the flexibility of WordPress. Say you want to have some type of site menu on your sidebar. You can use it to link to your best posts, post categories, or pages. Or if you have a few affiliate links you want to promote and of course links to your friends or sites you want to share with others. The next step is to add a new link category or as many categories as you need. In the WordPress dashboard, click Links, Links Categories. Now add a new link category, if you don’t give it one, the category slug will default to the same as the title. If you want to fill in the optional description, scroll down and click the Add Category button. The next step is adding a link to the proper link category. Click Manage then Links and add a new link. Remember this can be anything you want, like a page, a post, an affiliate link or any other link. When adding a new link it is important to expand the lower Categories box and I suggest choosing only one category for the link to be placed in unless you want it to show in different places on the sidebar. After you have the link categories and links added now it is time to add them to the sidebar. Click Appearance then Widgets. Scroll down and add as many Single Bookmark Category Widgets (up to nine) as you need. Now you simply add the Bookmarks From Category widgets to the sidebar, click the edit link on the added widget to expand them and choose what link category you want each one to display. Drag the widgets vertically into the desired position and scroll down and click the Save Changes button. I hope you see the possibilities here, in fact, I think this is a good solution for those running WordPress for a more traditional website. Another option with this is to remove the pages sidebar widget and manually add your WordPress pages into link categories for better site navigation and a more user-friendly site.